MTM Jewellers are the biggest supplier of silver and gold natural agate cameo jewellery in Australia. Our agate cameos are of the highest quality, only found and imported directly from the world's capital of agate cameo carving, Germany. Due to the hardness of these stones, they are most commonly ultrasonically carved. The stone is first dyed black, red, green or blue, a template of original hand work is then run through a computer program which proceeds to carve each piece individually. The colour is then chemically drawn back out of the face of the stone, leaving the face in its original white condition. The finished piece is very resistant to chipping and will not peel, crack, fade or discolour with age. This is the reason why agate cameos have turned out to be such an investment, handed down from generation to generation. 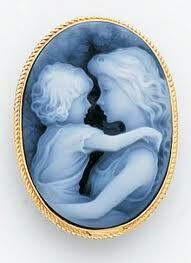 The sight of a pure, artistically carved agate cameo jewellery piece is a gratifying experience in itself. But when clubbed with a tag of irresistible discounts, it becomes more of a temptation. At MTM Jewellers, we value our customers more than anything and hence, we present to them tantalizing discounts that bring them even closer to us.